Kudos to GoFundMe for having standards. 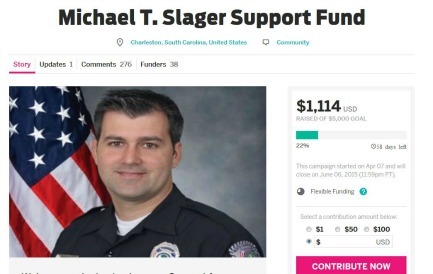 An anonymous supporter of former South Carolina police officer Mike Slager has launched a crowdfunding campaign on Indiegogo after his campaign was rejected on GoFundMe. We’re campaigning to show our Support for Officer Michael T. Slager! We believe in all of our LEOs and want to publicly support them! Although he may have made mis-steps in judgement he was protecting the community. Michael is a former Coast Guardsman with two stepchildren and a wife who is expecting a child, served for more than five years with the department without being disciplined. Please help in any way you can. He has served five years with the department without being disciplined. So far, the campaign has raised $1,114 of its $5,000 goal with 58 days to go. The ugly bias and injustice on this clip is stomach-turning and horrific. And isn’t it great when someone hides behind social media anonymity to call others cowards? But let’s put that aside for a moment to commend GoFundMe for having standards. That ThinkProgress story includes a statement from Kelsea Little, GoFundMe’s public relations manager, stating, “After review by our team, the campaign set up for Officer Slager was removed from GoFundMe due to a violation of our Terms and Conditions.” Little wouldn’t go into detail about what standards weren’t met, but quite frankly, we don’t care. We’ll say the standard of decency wasn’t met. How about that? But even those other platforms have rules about what can and can’t be posted. We support the First Amendment, without a doubt. But this is problematic, to say the least. Whether it’s because there was a breach of standard, or simply that GoFundMe took one look at that campaign and didn’t want to touch it with a 10-foot pole, it reflects well that they said no to this. There are a lot of people, including the family of Walter Scott, who appreciate it. Slager, 33, has been charged with murder and was fired from his job at the North Charleston police force. BTW, on CBS This Morning, NYPD Deputy Commissioner of Intelligence and Counterterrorism John Miller addressed procedure in a case like this. And The New York Times did an article interviewing a few experts on the topic. Across the board, everyone is against shooting a fleeing suspect under these circumstances.